September is the preferred time of relieving compaction and allowing air to enter the soil and help break up the thatch layer. By Aerating and seeding in the early Fall we provide time for the new grasses to mature. We also take advantage of cooler temperatures and the end of Summer drought. By removing cores of earth the surrounding root system is allowed to grow outwards into looser soil. These roots will continue to grow through Winter if the ground is not frozen. 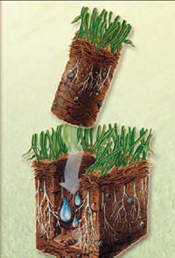 September aeration penetrates the thatch layer that may have arisen during the Summer allowing water to enter deeper into the earth feeding roots and carrying organic materials to the microbes. By giving the grass time to grow after aerating and seeding in September when Spring arrives those grasses will perk up and even provide them a good chance of being fully mature by the time Summer rolls around. Call us at 301-980-9005 to schedule Aeration and Seeding this fall. Or fill out our Estimate Form.